Romantics, lovers of nature and the glorious Welsh countryside, golden scooped out bays, laden blackberry bushes and crystal clear sea views – read on. Read on too, those who love a good nod to the environment – eco-chic-ers and glampers etc. 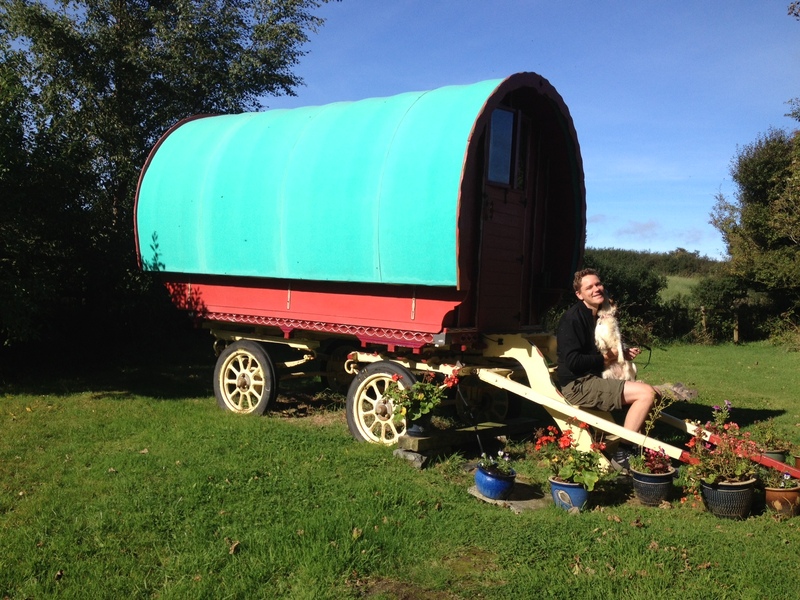 A couple of weeks ago, the two of us plus hound took a trip to one of right-on eco agency Under the Thatch’s most whimsical properties – a darling gypsy caravan in an orchard (with rather luxurious barn conversion with kitchen/lounge/bathroom close by). Meanwhile, here’s a review of our trip. WE’D set out to arrive before dark. But as with all the best laid travel plans, we’d failed, and found ourselves negotiating winding, Welsh lanes in the pitch black, me clutching two phones – one with the map open, the other featuring email directions. Tempers fraying, remarks curt and bearing a distinct tone of warning, we barked communication while the dog whined pitifully in the back, bladder full and belly empty. But grumpiness turned to relief as we drew down a shadowy track, finally spotting lights, and were greeted by Mandy, the friendly B&B owner at Morfa Isaf Farmhouse. “That’s good timing,” she chirped through our hopefully wound down window, directing us to our meadow and gypsy caravan. “I’ve put the lights on for you,” she added, and all three of us experienced the wave of relief any traveller feels on reaching their destination, unfurling achey bodies out of the car and breathing in fresh, clean night time air. The gypsy caravan by the sea is one of Under the Thatch’s most winsome properties. A grass-green and cherry-red, bow topped wagon, it sits prettily in its own private little meadow, with views over the blackberry-laden brambles straight out to sea. Worries about getting chilly in September were soon put to pasture by the incredibly efficient tube heating and thick, sheep’s wool insulation. 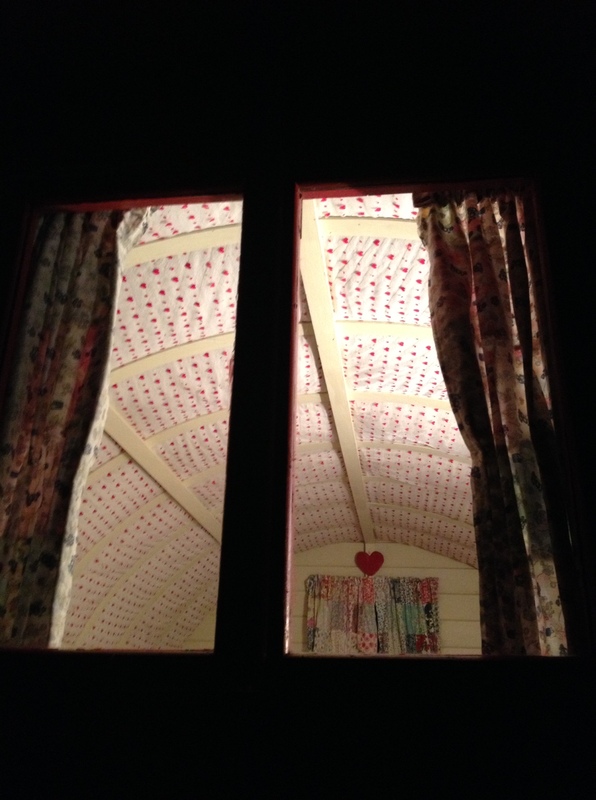 And with a high, snug bed, windows framed by patchwork, floral curtains and a heart motif that would have been shmaltzy anywhere else, it was love at first sight for us and the caravan. The meadow backs onto a converted barn, complete with well-equipped kitchen where we rustled up a late, and very welcome, dinner, and a bathroom – which proved the only slight disadvantage; dehydrated from our long drive, followed up with a couple of glasses of red, we made it through the first night, but had to take a little night time visit to the other end of our field during the second – it is quite a serious commitment to get to the bathroom in the middle of the night. Waking up in the morning, the ribs of the bow-top made for such a pretty bedroom I tried to carry on dozing with my eyes open just so I could carry on looking at it – which didn’t prove very effective. And catching September sunlight gently filtering round the curtain, the dozing didn’t last long – drawing the curtains to the view we’d missed the night before made our late arrival worth it. Overlooking the sparklingly fresh, expansive Ceredigion coastline, the location couldn’t be more picturesque, and after a few false starts trying to find our path, we scrambled our way down to the caravan’s ‘secret cove’, a golden sweep of sand carved into the steep cliff, seemingly inaccessible unless you know the way, and half-lapped over by gloriously clear water. We couldn’t resist a dip, and stripping down to our undies there was no chance of our privacy being interrupted – so we leapt in like seals, dragging the reluctant water-hating hound away from the seaweed she was busy killing. September sun glinting off the glacier-blue water, smooth, silken sand, and no one but us and the hound – it knocked some tropical locations I’ve been to into the proverbial cocked hat for enjoyability and a pristine beauty that left us giddy. 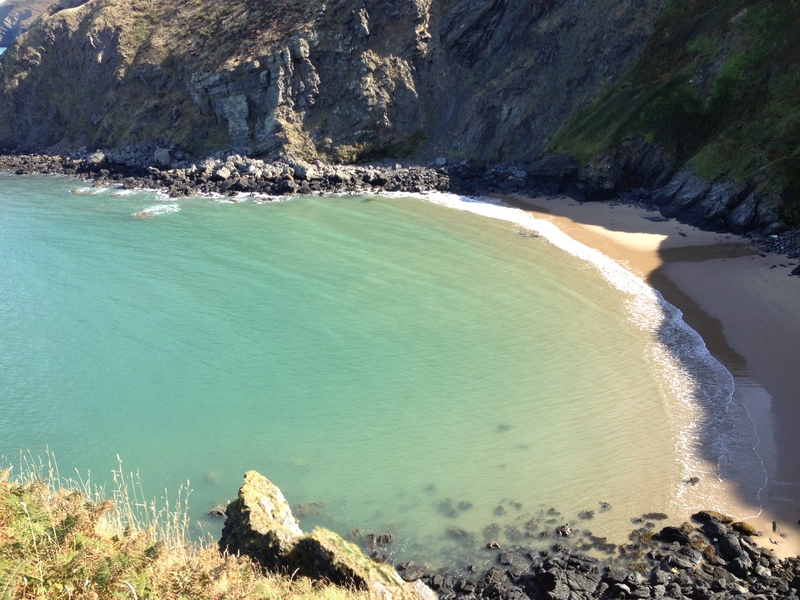 A walk along the dramatic coast path took us to nearby Llangrannog, where we treated ourselves to ice creams from the practically famous Patio Cafe – they’re recommended by Rick Stein, and made for a perfect holiday treat. And laden with produce and kindling from the nearby Llwynhelyg Farm Shop – “Oh yes, we’re a food county,” the lady behind the counter proudly informed us – we hunkered down by our campfire for the evening. A couple of locally brewed ales and some chunky slices of Welsh fruit cake bara brith for dessert later, we tucked ourselves in for another cosy night. The weather was even kind enough to let us enjoy another breakfast outdoors – farm eggs with local mushrooms and spinach on seedy, brown bread, before a wander over fields and through woods – it is such a pretty area. It was with a sigh and the kind of heavy heart that means you’ve had a darn good holiday that we said goodbye to our pretty little home for the weekend.